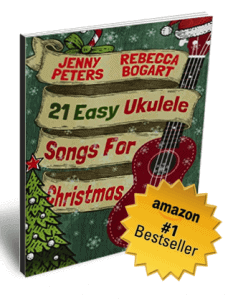 Beginner-friendly “21 Easy Ukulele Songs for Christmas” may be the easiest way to learn, play and master heart-warming Christmas songs on the ukulele. Named one of the top 10 ukulele Christmas books by ukulelemusicinfo.com. This is not just a book of songs. The authors teach you how to play them in the book and via free online videos included with your purchase. All songs are arranged in order from easiest to hardest, starting with great-sounding 2-chord songs you can learn in minutes. Diagrams and photos of finger placement for all chords eliminate frustration (see page 9). All songs include lyrics and both musical and tab notation. Don’t read music? Difficulty with chords? Simply follow the tabs and play melody. The authors make it as easy as pumpkin pie! You’ll be learning from the award-winning musicians and music teacher duo who authored the best-selling book 21 Songs in 6 Days… and developed a popular ukulele teaching curriculum used by thousands of students. – How to read tablature (tabs) – even if you’ve never played before, this book is all you need to play beautiful Christmas songs, quickly and easily. – How to perform easy or elaborate strumming patterns for each song to suit your skill level and add interesting variety. – How to fingerpick and use simple techniques to create different sounds to add your own flair to your Christmas songs. – How to play duets with a friend or family member for a richer-sounding arrangement (perfect for caroling at home or around the neighborhood). – Plus a brief history of each song, a glossary of terms, and more. It’s never been easier to learn, play and master some of the greatest Christmas songs ever written. You’ll be ready to impress and entertain your friends and family this Christmas and for many more to come. and have yourself a merry little Christmas day!